ou might have noticed new green signs around MC level directing patients to the new flu clinic. We’re trying to track who is sent there, from the ED. The new flu clinic is open from 9a-9p and is intended for treat & release patients. They have a limited capacity to give IV fluids or meds (If you have a patient with markedly abnormal vitals or substantial comorbidities, or you think your patient may end up getting admitted, this is NOT a good candidate for the flu clinic). Measles is an acute viral illness characterized by a prodrome of fever (101o – 105oF), cough, coryza, conjunctivitis and Koplik’s spots (punctate blue-white spots on the bright red background of the buccal mucosa). 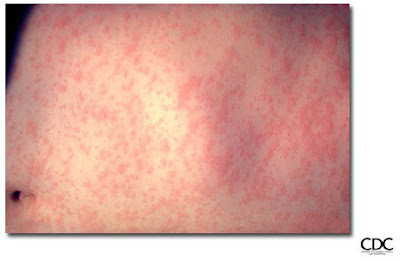 The measles rash is erythematous, maculopapular and lasts 5-6 days. It usually starts on the face and proceeds down the body to involve the extremities last, including the palms and soles. The maculopapular rash is usually discrete but may become confluent on the upper body. The rash resolves in the same order that it appeared. Complications such as diarrhea, otitis media and pneumonia are frequent in young children.